A lot can change in a week, and this is certainly the case when it comes to hurricanes. In the days leading up to Florence?s arrival, everyone was glued to the all-too-familiar National Hurricane Center?s Forecast Cone, to see if Hatteras and Ocracoke Islands were in the dreaded white projected center of the storm. And for quite a while, we most definitely were. This is why when a mandatory evacuation was called on Monday, September 10, a number of islanders who rarely leave for hurricanes packed up their vehicles and hit the road. Many of these residents hadn?t left for a storm since 2011?s Irene or even 2003?s Isabel, and most evacuees made sure to pack along their irreplaceable belongings in case they couldn?t come back. In retrospect, this may seem like pessimism at its most paranoid, but you have to remember that for a number of days, it appeared very likely that Hatteras and Ocracoke islands were going to be hit by a Category 3 or 4 storm. The worst case scenario had us directly in the crosshairs, with Florence stalling and hovering for days, inundating the island with unprecedented rain and storm surge. Indeed, this is exactly what happened, but it didn?t happen on Hatteras or Ocracoke islands. In the days that followed the evacuation, Florence?s projected path ? which had originally been aimed at the Outer Banks ? continually shifted south, until the islands were subsequently outside the Forecast Cone altogether. And while every single village was impacted with ocean overwash during the storm, the islands were spared the brunt of the damage. Florence eventually made landfall as a Category 1 on Wrightsville Beach ? much weaker, and much further south, than originally forecasted. Dare County Emergency Management made the right call to issue an evacuation with the information they had at the time, as the Outer Banks was a prime target for the majority of the early forecasts. But what occurred in the several days before slow-moving Florence finally impacted the coast to change the trajectory so drastically? Why did Florence move 200 miles to the south, when it initially seemed so certain that she was headed our way? To understand the drastic change, it helps to take a look at the complete path of the storm, as well as those seemingly last-minute changes which spared the Outer Banks, but which prompted historic flooding and damage to our coastal neighbors. Per the National Weather Service, Hurricane Florence was a long-lived Cape Verde hurricane and the wettest tropical cyclone on record in the Carolinas. The sixth named storm, third hurricane, and the first major hurricane of the 2018 Atlantic hurricane season, Florence originated from a strong tropical wave that emerged off the west coast of Africa on August 30, 2018. Florence became a tropical depression near Cape Verde on August 31 and progressed west-northwest, becoming a Tropical Storm on September 1. Florence strengthened rapidly on September 4?5, becoming a Category 4 storm with maximum sustained winds of 130 mph. She weakened to a tropical storm by September 7, but the system regained hurricane strength on September 9, and then increased to major hurricane status with winds of 140 mph on September 10. This is when the mandatory evacuation was issued for Hatteras and Ocracoke islands. When it came to Florence?s eventual turn, it all boils down to a large ridge of high pressure that was just north of Florence, and which ended up steering the storm as it approached the coastline. ?The big question we had during the entire event was how strong is the ridge going to be?? said Morgan Simms of the National Weather Service Newport / Morehead City office. ?Depending on the strength, [Florence] would go north if it was weaker, and would go south if it was stronger, which is precisely what happened.? Essentially, that high pressure ridge prevented Florence from moving north, but once it arrived along the coast, Florence slowed to a crawl. ?Basically, the steering currents that would determine where the storm would go collapsed,? said Simms. ? ?The high pressure ridge prevented the storm from turning north, but once the storm started to move a little west, there was a competing high to the west. As a result, we started to have competing currents which essentially cancelled out any [movement.]? ?Once it finally moved to Wrightsville Beach, then we had a more dominant steering current to take it west and eventually move it north – But as we saw, it took a few days.? And this nearly stationary movement is what impacted some areas of the coastline so devastatingly, and left other areas relatively out of harm?s way. As Florence sat just off the coastline, the rain bands associated with the storm would go over the same area again and again. With the islands located just northeast of Florence, the rain bands barely extended all the way to the Outer Banks, while areas south and west of us were inundated. An aerial image of Florence approaching Wilmington on September 14 shows just how close the Outer Banks was to being in the center of those heavy rain bands that steadily hammered nearby areas, including Beaufort, New Bern, and mainland Hyde County. ?Hatteras Island didn?t get a whole lot in terms of rain compared to other locations, but it still wasn?t negligible,? said Simms. ?Frisco received 6 inches of rain, but then north towards Manteo, there was only 2-3 inches of rain.? Meanwhile, areas of Onslow County received 30? of rain or more as Florence stalled for days with little forward progression. By the evening of September 13, hours before landfall, Florence had been downgraded to a Category 1. 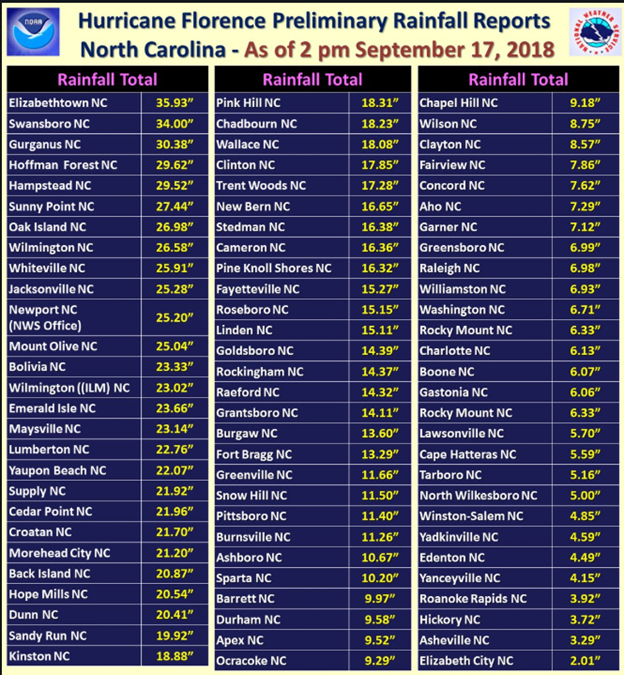 Per the National Weather Service, this was due to an increasing wind sheer disrupting the central cone of the storm as Florence approached the coast. This had some evident pros and cons, as even though the maximum wind speeds of Florence were reduced, the wind field expanded, which meant that more regions along the coastline were impacted by tropical storm-strength winds or greater. Per the National Weather Service, the historic legacy of Hurricane Florence will be record breaking storm surge of 9 to 13 feet and devastating rainfall of 20 to 30 inches, which produced catastrophic and life-threatening flooding. The hardest hit areas included New Bern, Newport, Belhaven, Oriental, North Topsail Beach and Jacksonville, along with Downeast Carteret County, or basically south of a line from Kinston to Cedar Island. A storm total rainfall of 34.00 inches was reported in Swansboro, while the NWS office in Newport recorded 25.20 inches. Wind gusts of 106 mph were reported at Cape Lookout with 105 mph at nearby Fort Macon. ?In the surveys we?ve done across eastern North Carolina, many locations showed that Florence had outdone [1999?s] Floyd in terms of surge,? said Simms. ?In Onslow County, just outside of Jacksonville, we saw markers with Florence that were feet above where Floyd was.? ?And the rainfall was unprecedented,? said Simms. ?So the combination of storm surge plus the incredible amount of rain on top was not going to be a good situation with river flooding. All that water was rushing into the rivers, being pushed by the wind, so that forces the water up. And then add all that rain on top of it, and it?s a lot of water for the rivers to deal with.? Photos of impassable interstates that resembled rivers, or towns that were completely drenched underwater, went viral and became the lingering image of Florence ? a powerful storm that lingered, and which caused virtually every river in the state to flood. Hatteras and Ocracoke islands were spared, to be sure, but this was not much comfort to islanders who emphasized with the devastation that folks were dealing with just miles away. When you?ve been through that sort of a life-changing storm ? like Isabel or Irene ? it?s hard to feel grateful about your own good luck when you are very aware of what other people are going through. That?s why instead of cleaning up yard debris, sand, and other telltale markers of a recent hurricane, residents were once again loading up trucks and boats in the immediate aftermath of Florence ? not to evacuate this time, but to deliver whatever was needed to our southern neighbors. ?If we didn?t have the ridge above us, and if Florence had headed to Hatteras Island instead, the storm surge situation would definitely have been different,? said Simms. ?These [prospective] impacts are highly dependent on the exact track of the storm and where the center passes, but there?s a pretty decent probability that the impacts would have been worse than what you received.? Granted, it?s impossible to create a precise hurricane ?what if? scenario when there are so many variables that decide the eventual path of a storm, but even a layman like yours truly knows that a Category 4 hurricane making a direct or nearly-direct hit on the islands doesn?t end well. 1993?s Hurricane Emily was a Category 3 when it brushed the Outer Banks before heading out to sea, destroying 500 homes on Hatteras Island in the process. 2003?s Isabel, which made landfall almost exactly 15 years before Florence on September 18, was a weak Category 2 when it separated Hatteras village from the rest of the world, and 2011?s Irene was a Category 1 when it cut a series of new inlets into northern Hatteras Island. Only one Category 4 storm has ever effected the Carolinas ? 1954?s Hurricane Hazel ? which destroyed 15,000 homes and damaged 40,000 more. Landing along the North Carolina / South Carolina border, it was reported that more than 80% of the structures in Myrtle Beach were destroyed, while virtually every pier within 170 miles of landfall was demolished. Today, a number of island residents who left for Florence may be looking back at their decision to evacuate, and wish they had just stayed put instead. It?s understandable, because evacuating is always a special sort of expensive chaos. But if you?re in that group of folks who left and went inland, and as a result may have even received more of Florence?s impacts than those who stayed behind, don?t second guess that decision to evacuate. You never know what a storm will do. A high pressure ridge is what spared the Outer Banks during Florence, but as the inland and southern coastal images and videos so heartbreakingly capture, it could have been a drastically different outcome. What’s Going on with the New Dare County Flood Maps? On June 30, 2016, the North Carolina Flood Risk Information System released the first version of new preliminary Flood Insurance Rate Maps (or FIRMs) for Dare County. The FIRMs are updated every 10 years or so, and the last update for the county was in 2006. Traditionally, the process to convert to new FIRMs takes roughly 18-24 months, as a series of procedures must be completed before the new maps can be adopted. This includes a 90-day public comment and appeal period, a subsequent review by FEMA to make changes to the maps as needed, and – eventually – a letter of final determination that cements the maps, and gives Dare County an effective date of implementation approximately six months after the letter is issued. It should be noted that many property owners throughout Dare County have been anticipating the implementation of the new flood maps, and for good reason. When initially introduced to the Dare County Board of Commissioners at a meeting in June of 2016, Steve Garrett of the Flood Plain Mapping Program and Dare County Planning Director Donna Creef both confirmed that many homeowners would benefit from the updated FIRMs. “The good news is that a lot of properties are coming out of the flood zones,” said Creef at the 2016 meeting. Garrett reported at the time that unincorporated Dare County, which includes Hatteras Island, had 1,800 structures in the high-risk VE category, and that number would be reduced to only 124. The county had almost 13,000 structures in the AE zone, and that would come down to about 8,500. The others would move, perhaps into the X zone. Two new zones are also included in the new maps — AH, which applies to the area between the highways that floods in Kitty Hawk, and AO, which applies to some areas that are subject to shallow flooding, and which includes roughly 893 structures countywide. (If you haven’t seen if and how your property is affected, you can still check it out via the thoroughly interactive website found here: https://fris.nc.gov/fris/.) So the ball to adopt the new maps has been rolling for some time, but the process is still ongoing roughly 2.5 years after the maps were introduced. So what’s the hold up, and what’s being done? Here’s a closer look at where we are, and the steps the county is taking to move us forward. Could pathways, trams, and the passenger ferry mean more visitors for Hatteras? Are There More Rip Currents This Summer, or Just More Attention? Is the Emergency Ferry Route Ready for a Hurricane?